John Roberts is one of the more original and independent thinkers among contemporary art historians, and his wide-ranging reflections often take him well outside the boundaries of the discipline. In fact, he sometimes seems at pains to obscure what might be called the art-historical use-value of his work in order to underline its broader implications; he prefers to be seen, it appears, as a sort of unlicensed philosopher. Thus, his previous book, The Intangibilities of Form: Skill and Deskilling in Art After the Readymade (2007), was one of the most consequential recent interpretations of Marcel Duchamp as well as of the consequences of Duchamp’s work for more recent art; yet by framing the essay as something more like an exercise in philosophical aesthetics—the adumbration of a “labour theory of culture”—he effectively obscured his book’s contribution to art history. Is this blurring of disciplinary boundaries a mistake? One can only reply as Zhou Enlai is supposed to have done when asked about the success of the French Revolution: It’s too early to tell. (The remark may be apocryphal, but as Roberts says, it is “of supreme value in any critique of [vulgar] historicism” [275 n38].) I suspect the value of The Intangibilities of Form will become clearer with time. 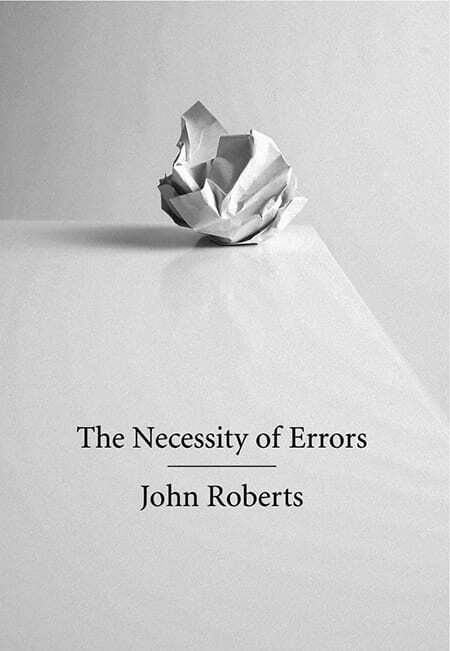 With his new book, The Necessity of Errors, however, Roberts has increased his risks. Rather than setting up two stools between which he might fall, here there are four—philosophy, psychoanalysis, politics, and art—or even five, since he divides his treatment of philosophy into two parts: the philosophy of the subject and the philosophy of science. An additional pitfall is created by his avoidance of any determinate specification of what he means by “error.” At the beginning of his introduction, when Roberts challenges his reader to “imagine a world in which everything you said was right, and everything everyone else said was also right, a world, in fact, in which there was no error” (3), he seems to presume this utopian/ “dismal” state of errorlessness would be founded on simple factual agreement: “This ball is 10.769 centimeters in circumference and will travel at 39.43 miles per hour, when I throw it. Yes, that’s indisputable” (3). But it quickly becomes evident that Roberts is uninterested in mere errors of fact. His subject is how errors may be productive, and most are not. Nor does he analytically distinguish among errors of belief, of judgment, and of action, and therefore he cannot show how these may be intertwined in given cases. Consider “the goalkeeper who makes too many unforced errors, losing matches” (16); does he misjudge the ball’s speed or direction or simply slip? Furthermore, it may not be clear for whom a given error may be productive:“The error that destroys a career may be assimilated by an other or others, but not by the person who committed it” (16). A physician’s error may lead to the death of a patient, but surely the persistent work of the doctors of centuries past—in the face of what we now consider their relative ignorance and despite the fact that they may have done their patients as much harm as good—has contributed to the greater success of modern medicine. However, Roberts wants to say more than what is self-evident, that the errors of the past contribute to the knowledge that succeeds them insofar as they can be identified and eliminated. Errors, he claims, “also have another kind of life, a veiled and subterranean one,” as in psychoanalysis, where error and truth are entangled in different ways thanks to “the divided condition of the analysand who cannot be told the truth, and the analyst who is unable to tell the truth” (17, emphasis in original). Error and truth may coexist in such a case as Siamese twins joined at the head or heart—you can’t have one without the other. But if the distinction between error and truth can be conceived of straightforwardly as far as science goes, while becoming almost perversely elusive in psychoanalysis—also, perhaps, in politics—how does the concept of error even enter the realm of art? We are accustomed to seeing progress in science, or at least to acknowledging its possibility, and likewise the psychoanalytic process is supposed to advance to the point where it can be declared successful. Freud wrote of “analysis terminable and interminable,” but his reminder that there must always be something incomplete about any psychoanalysis was intended to perspectivize ¾rather than negate¾the idea that, practically speaking, it might nevertheless be sufficiently achieved. An artwork, too, might in some cases be only relatively achieved (one thinks of Paul Valéry’s dictum that a poem is abandoned rather than finished and Willem de Kooning’s adaptation of it to painting), but this is not necessarily in the name of greater truth. It is axiomatic that there is no progress in art, and while this cannot be strictly true across the board—one does not hesitate to speak of a student making progress in her art—there really does seem to be some level at which achievement becomes incommensurable. One may still speak of success or failure, and it is hard not to concede Roberts’s point that “there is nothing to be won critically from unambitious failure” (247), but it seems strange to speak of truth and error in art. The closest thing until now that I am aware of as approaching a theory of error in any of the arts would be in Harold Bloom’s writings on poetic influence as misreading, notably A Map of Misreading (1975). But Bloom’s own revision of a distinction between reading and misreading into one between weak and strong misreadings can serve as a reminder of how hard it is to grasp the distinction between truth and error in the arts. Roberts never squarely addresses the apparent incongruousness of the word “error” when applied to the practice of art. The closest he comes to this is the deeply puzzling statement that while “art’s relationship to the claims of knowledge may be discontinuous and non-accumulative . . . it shares with science the notion that its judgements about best practice are based on some notion of the explanatory power of its theoretical commitments” (23). This would be pretty vague, even if it were not predicated on the notion of a notion. But to the extent that one can clarify the assertion, it hardly seems one that would gain the assent of most practicing artists—or even art theorists, who seem on the whole to be comfortable with the division of labor between artists and art theorists whereby artists may have and work with theories but in mostly nonrigorous and pragmatic ways. Roberts acknowledges that “no single artwork is falsifiable as a form or item of knowledge” but still wants to believe that “its theoretical claims can certainly be evaluated in terms of the work’s social coherence or incoherence” (23). However, whether there is any clear relation between a work’s supposed “theoretical claims” and its content as art is ambiguous at best. All the more ambiguous is how and whether the truth or error of such claims is related to artistic value. Which errors are the right ones, and who has the authority to adjudicate? In 1978 Julian Schnabel declared his art to be “a bouquet of mistakes.”1 Although Roberts does not refer by name to any living artist except, in passing, Robert Morris, who is a generation older than Schnabel (though there a few nods to more recent trends such as the “pathetic art” of the 1990s—a highhanded dismissal—or more recent activist art projects, which he thinks may simply accede to “the hubris of non-aesthetic reason and its ruling means-ends logic” 247), it seems easy to divine that he would turn up his nose at Schnabel’s bouquet. But it is still not clear how one might extend a sensus communis to one’s taste in errors. In other words, such strategies do not necessarily constitute “deskilling”—to borrow the term that Roberts used in The Intangibilities of Form, taken in turn from Harry Braverman. Rather, they often have to do with the establishment of new forms of discipline contradicting those that had been inculcated to the point of becoming intuitive under existing criteria of correctness—what Roberts himself calls “a new way of understanding the artist’s skills and competences and art’s place in the world” (213). Thus, to accept the labeling of Manet’s innovations as so many “mistakes and errors of execution and subject matter” (211) would merely be to join his conservative academic critics in the dustbin of history—an intellectual error if there ever was one. Today the strategies of inchoateness, formlessness, and so on are methodologies taught in art school and quite capable of being judged according to criteria of correct application. Roberts believes that art’s post-Manet history of self-undermining distinguishes it from both science and politics on the grounds that the latter “do not voluntarily seek their own destruction or dissolution as categories, or subject themselves to a succession of feints and dodges, on the basis of the critique of their alienated character” (24).At least as far as politics goes, the statement is arguable. An operative of the Democratic Party in the United States might view the activities of a member of, say, a Trotskyite splinter group as outside the category of politics altogether if not destructive of the essence of political action—and vice versa. What should be recognized as politics according the Platonic Maoism of Alain Badiou is a surpassingly rare occurrence that cannot at all be recognized in the doings chronicled in the political pages of your daily newspaper—and this fact must be part of the political force of Badiou’s writing, if it really has any. The anguished complaints of mainstream commentators that the Occupy movement failed to present any “demands” showed that something fundamental to a certain conception of politics had been bypassed. So some ways of doing politics do seem to involve dissolving existing definitions of politics or critiquing the latter through various “feints and dodges” after all. That said, Roberts’s chapters on politics and psychoanalysis are probably the most challenging and suggestive parts of The Necessity of Errors, though I am probably not the person best positioned to critique them in any thoroughgoing way, nor is this the most apt place to do so. Curiously, his most revealing insights on Hegel, a presiding figure for this book thanks to the salient place of error and errancy in his phenomenology, are in those two chapters rather than the opening ones on philosophy. In the wake of the French Revolution and in contrast to the reactionary interpretations of it offered by writers such as Edmund Burke and Joseph de Maistre, as Roberts shrewdly points out, Hegel’s work was of political import as a defense of “the productiveness of error as the contingent presence of human agency in the face of [a] counter-revolutionary turn to predestination and providential action . . . and the extreme counterintuitive account of error-as-support-to-faith” (166). The fact that the culminating chapter is on art—and not, for instance, on politics as the most comprehensive category of human endeavor—is surely significant. Art, for Roberts, is a realm in which error becomes paradigmatic, in which “antisystematicity” is systematic. Although Roberts does not take this step, however, he might have gone on to say that in taking error as fundamental, art dissolves error as a category. When error becomes one of many options, or even the right thing to do—a fortiori if it is the only thing one can do—then it has become meaningless to call it error. Barry Schwabsky is art critic for The Nation and coeditor of international reviews for Artforum. His forthcoming books are a collection of poems, Trembling Hand Equilibrium (Black Square Editions), and two books of criticism, Words for Art: Criticism, History, Theory, Practice (Sternberg Press) and The Most Beautiful Perhaps: On Poetry Mostly (Black Square Editions).